There are many log cabin roofing choices available today -- just as there are for conventional houses. With your selection of what material to use to cover your log home from the weather you need to factor in durability, cost, looks and utility. Structural insulated panels are rigid panels with the foam core of insulation bonded to a stiff outer skin of OSB, thereby creating structural strength. They are ideal for cabin roofs as they are inherently more efficient with each air tight panel giving superior thermal performance. The structural insulated panels are modular building components which are quickly erected, saving dry-in time and costly labor and protecting your log home from the weather. Quality -- The substrate (typically a non-rusting alloy such as Galvalume) is coated with a long-lasting paint that won't wear away or chip off. Price -- You can save some money using screw-down, V-rib panels instead of standing seam roofing. Installed with special metal roof screws that use concave washers to protect the neoprene seal around the screws, you can install it and forget worrying about your roof for a couple of generations. In addition, the full-length panels install quickly, saving on labor. 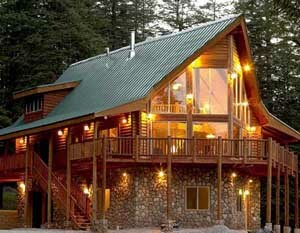 In many fire-risk areas you can get a break on insurance costs with a metal roof installed on your log home. Efficiency -- An energy-efficient log home will utilize a reflective barrier under the metal roofing to block up to 96% of the radiant heat from the sun, saving energy costs. Ease of Use -- The panels install quickly and can be cut easily using corded metal shears. Some people worry that metal roofing is loud in the rain, but good insulation will block most of the noise. And I find something soothing about falling asleep to the sound of the rain drumming overhead in a snug, cozy cabin. 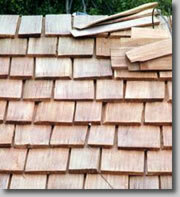 Everyone is familiar with the standard shingles used on most houses across the USA. Asphalt and fiberglass shingles are economical and being the norm, it's easy to find roofing contractors able to properly install them. 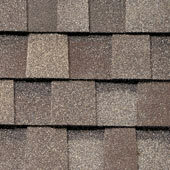 New shingle designs offer a wide range of colors to suit your log cabin design. Thicker, "architectural-grade" shingles break up the monotonous look of flat shingles, offering shadow lines and a dramatic, solid appeal. Don't scrimp on asphalt and fiberglass shingles, even if they offer 15- or 20-year guarantees. For only a little more money you can get shingles with much longer warranties that will provide better protection and a nicer look throughout the lifespan of your log home roof. When you start to see granules of sand in your gutters or bare, bald patches starting on your cabin roof, your shingles are reaching the end of their useful life and it's time to consider re-roofing. 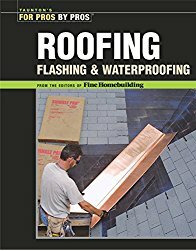 Asphalt and fiberglass shingles are also susceptible to damage and shortened lifespan from high heat generated by an inadequately ventilated roof. Be sure you have sufficient soffit vents and ridge vents installed to allow the heat to escape from the roof without damaging the shingles. There should be continuous air-flow paths from the soffits to the roof ridge. Wood shingles and shakes are the traditional choice for cabins, adding a rustic charm to your log home roof. 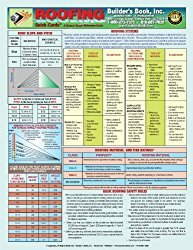 What's the difference between wood shingles and shakes? Wood shingles are sawn. They are flatter and more even. Shakes are split and tend to be chunkier and uneven. A properly-installed shake roof can last 50 years or more and weathers to a natural color that complements the rusticity of your log home. Wood shingles and shakes expand and contract slightly with changes in heat and humidity. It's important that they are installed with a slight gap or space between each one to allow for expansion without splitting. If wood shingles and shakes are installed tightly together they can cup or buckle when they expand with humidity. Continual advances in roofing products have generated some interesting new choices in green building. Recycled material is being used to produce cabin roofing products, including recycled tires that mimic the look and durability of slate. They are a fraction of the cost and light enough to not require the beefed-up roof structure necessary to support a solid slate roof. Want to incorporate solar panels into your roofing? New thin-film solar technology is making it possible to install small solar receptors on every shingle. This turns your entire cabin into one giant solar collector. Responsible use of renewable, clean solar energy with no maintenance and a relatively short pay-back period -- what's not to love? Some folks are even growing a garden on their cabin roof. Green earth roofs are an energy-efficient way to not only seal the roof of your log home, but they also control water runoff and erosion. These living roofs allow you to utilize that rain to grow flowers or vegetables and have an outside garden room on your roof. The earth cabin roof provides outstanding insulation with an unobtrusive, low-impact installation. The choice you make for your cabin roofing will affect not only your initial build budget, but will also reflect your aesthetic vision for your log home. Choosing the correct log cabin roofing can reduce maintenance over the years, offer a greater sense of protection and security, and increase your enjoyment of your dream log cabin. Most cabins will need to utilize a structural ridge beam for their roof to accommodate the large, open cathedral ceilings that suit cabins so well. Without overhead ceilings and therefore floor joists to tie together the outer walls, a structural ridge eliminates the need to counteract the outward thrust of conventional rafters. Regardless of which material you select for your log cabin roofing, remember that the larger you make your cabin roof overhangs, the better off you'll be. Protecting the logs, windows, doors and trim from excessive sun exposure and rain splatter increases their longevity and reduces your maintenance chores.